Since 2000 MD Entree has established itself as a leading developer, producer and distributor of an up-to-date range of mats, suitable for both indoor and outdoor use. Our office and warehouses are based in Genemuiden which has been a trusted address for over 100 years for the flooring trade! MD Entree is active in more than 20 countries and supplies only B2B. Our customer base consists of DIY, carpet and furniture stores, supermarkets, garden centers and gift shops and mail order. This wide range of customers has resulted in an unique collection anywhere else in Europe. Innovation in the field of material choices, in house developments, market knowledge and great enthusiasm has ensured that MD Entree has become one of the most important players on the European market. Every day we are looking for inspiration for new designs, a pleasant experience or a stylish way for new applications. To do this, we follow the trends, we listen to our customers and we are actively looking out for new solutions. 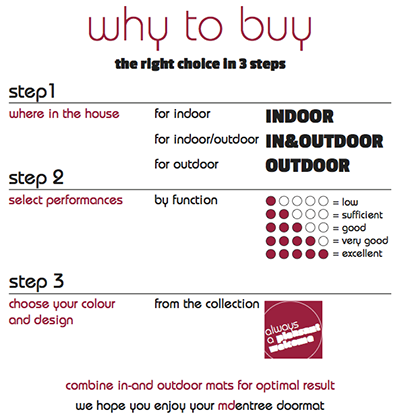 MD Entree has been in the spotlight for indoor and outdoor mats and multifunctional runners for more than 15 years. We deliver our collections through independent retail stores, retail chains, retail organizations, wholesalers and mail order companies. MD Entree always has the focus on innovation and may be seen as a European trendsetter in the industry. Our slogan 'Always a pleasant welcome' is the thread that guides our actions every day. Together with our staff, suppliers and customers, we are working on improving in all aspects continuously, so that the end-user can value our products during the purchase process and practical use.